Yarn and Fiber Happenings: New Addi Lace Needles US #7, 8 & 9 PLUS 40" Lengths!!!! New Addi Lace Needles US #7, 8 & 9 PLUS 40" Lengths!!!! Okay so I get excited about weird things. 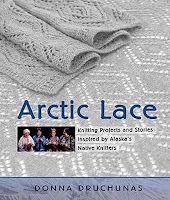 Like when the Addi Lace Needles arrived from Skacel a few months ago - I tried them and was hooked! Love the pointy tips! So, I worked with them, loved them, and then tried to go back to my other needles... nope... wanted pointy tips to the point of (no pun intended) of trying to adjust gauge to fit onto a US #6 (as that is all the needles went to) UNTIL NOW!!!! YEAH!!!!! 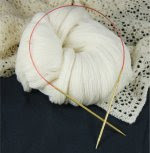 We just received our Addi Lace Needles in US #7, 8 and 9's in every length available - 24", 32", 40" and 47". I am a very happy knitter! Oh and if you didn't notice, there is a 40" length that has been added for all the lace needles sizes... those are here too! Woohoo! Oh, and if you haven't tried these needles they aren't just for lace knitting! These needles work great for all yarns..... I recently started making Knitty's Fetching Gloves using Jade Sapphire Mongolian Cashmere 4-Ply and the magic loop and these needles are awesome. Also, I am in the startup of a cowl from Arctic Lace using Mirasol Sulka (a very soft spun blend of 60% Merino Wool, 20% Alpaca and 20% Silk) and can't wait to move them to the new lace needles (need a size US #8) as the pointy tip will help from splitting the fibers due to the nature of the softspun. Ah, all is good in the land of the knitter! PS - these really are just released and would a great gift for your knitter that has everything! The Rachel John Extreme Knitting Needles are also a great gift! 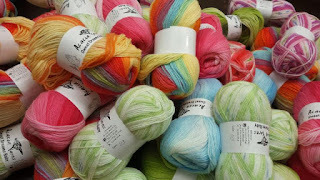 I should start up a "for the knitter who has everything" list... let me know if you have any thoughts for the list...you know the items that only the extreme knitter has, wants, needs, doesn't know about but will love!